Sugar is poor. The person that plays Sugar has ISK across several accounts but Sugar, as an individual character, is poor. That was to keep my ISK safe from an oops. She rarely had more then a hundred million on her and normally less then that. It let me safely handle scam contracts and such things. That got in the way when I decided to undock and get the new Command Destroyer skill book. I pried myself from the warm seat I had made in Jita and after much whining, was directed to a skill book store. Such was my glorious undocking into the wilderness of the Jita undock. Shuttles are very cool. They are cheap and they are fast. But, in Jita they are also targets. I find myself feeling rather stupid that I want to fly around in a shuttle. Someone can pop it just for the hope that I've stuffed my cargo full of goodies at not great loss to themselves. I docked up. Then Eve crashed. Then it came back up. I sniffed about the corners of my Jita hangar and pulled back the dust cloth on Ecstatic Cider. Ecstatic cider is an Orthrus that was gifted to me to lure me into trying out missiles. I don't deserve such a sweet gift and to show my thanks for it, I learned missiles. I never flew it. Today is the day. I might not do anything with it but I had learned missile skills for this moment. My completely technical method of what ships I do and don't like is done by an puttering around and seeing how it handles. I spun off the undock and wheeled around the arch under the station. The Orthrus is responsive and smooth with enough speed not to leave me grinding my teeth. The only question is will I like missile combat. Everything I have read about missiles makes them sound exhausting and unfun. I like going, "Weeeeeee!!" as I shoot things. Maybe I've listneed to to many endless, circular arguments about stuff and missiles will be fun. 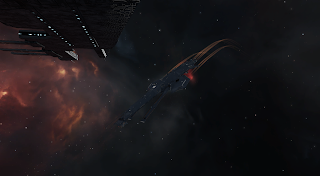 Go run a Frostline site in hisec :) You'll get to try those missilez out plus pickup some goodies too. Going "Weeeee!" as you unleash hell in the form of extra-speedy missile bombardments is more than okay :) Have fun! Just think of it this way. Missiles may or may not be more fun than guns, but they're definitely more fun than drone combat. I also like watching the little ball of light fly toward the target then go boom. It's a satisfying visual. Missiles fire with a woosh and fly through space leaving smoke trails. For a few brief seconds they are little ducklings to your Mother Duck Orthrus. Miss Iles are female. Stand up for female weapons, they deserve their chance too.